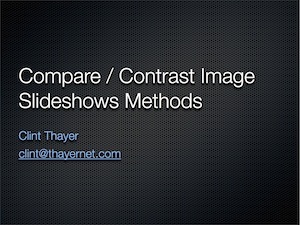 Adding notes and slides from this weekends talk at Drupal Camp WI on different ways to provide image slideshows / rotator modules. I've been at DrupalCon in San Francisco for the past few days and I thought it might be helpful to talk a little about what I'm finding in the process of leaving the laptop at home and using the iPad as my primary conference tool. There are 3000 technology folks at the conference, mostly with power hungry laptops. Good luck finding a power source during the 10 hour day. In contrast, the iPad keeps going without the need for charging, or the need for additional batteries or power cables. I had used it all day Monday, recorded a number of talks while taking notes and I had 41% battery life when I got home. Today I elected not to record and that gave me the chance to bounce around to different apps (yea, yea we don't have multitasking yet) and my battery life is suffering a bit more at 29% after a solid 10 hours of use. If I push it I suspect this thing would last another few hours, and much longer then I can go! Keyboard still rocks, cursor position UI feels slow. I had very little issues getting text into the device in all of my notes. When I made mistakes, it took me a longer then desired to fix and edit my text. I would suggest editing be done after the fact and perhaps on a normal keyboard based computer. As a simple note taking device, this thing is fantastic. Please be careful with the auto text fixing functions with the OS. I had a number of times it would change something for me that I didn't want changed. You have been warned. A number of people have made comments on the weight. I was one of them. As a book reader it does seem a little heavy, but as a conference/meeting tool, it is so nice to toss the iPad into a small case, or just carry it from meeting to meeting. I can't stress this enough, when there are 3000 people coming and going from 8 different rooms, being portable makes things so much easier on life. We need a better note app. While the built in Notes app does the job for a quick note, I want something a bit more powerful. I've tried Evernote and a few others, but the one that seems to be the best mix of functions and stable releases seems to be SoundPaper. What I like about sound notes is the ability to record the meeting at the same time as taking notes. This is not new in this class of apps, but what sound notes does that others don't is the ability to tap on a word of your notes and have the recording auto jump to the time point when that word was typed. This is a killer feature! That is not to say the app is not error free. There seems to be issues with some of the core OS functions of text entry, but the developer mentioned in a private email that updates are coming soon that address some of the issues, and additional updates in the next month that should help. Some notable runner-ups would be Audiotorium, but the bookmark feature is not as clean as SoundPaper and the app is very unusable with bugs that would not allow me to scroll, or do bookmarks in the app. I'm also not a big fan of the script font so having some settings to change the font to something a tad more readable would be nice. The developer also mentioned an update coming very soon that would address some of these issues, so I would like to reserve judgement on this app until I see some updates. Who will win my heart in the end? I'm pulling for SoundPaper as I really like the ability to tap on a word and have the recording jump to that time point. Send an email to the developer to mention that you would like to see this app continue to see updates, and new features added. UPDATE: in the process of editing this post the Audiotorium app was updated and it looks like they too added the same feature of tapping in text to auto jump in the audio I've found that is the killer feature of SoundPaper. I've not had the chance to field test it during the conference so look for an additional update in the future. UPDATE 2: Still having issues with scrolling, and the new feature does not seem to be working. I suspect this app needs to bake a bit more. Evernote is also an option. I'm not a fan of the UI so I dropped that app pretty quick. I find that Evernote users really like the option to sync between different devices, but in my use case, I would love to have a notes app that would have some option to integrate with Google docs and primarily the ability to edit and save up to Google Docs universe. This would kill Evernote. We need a better Twitter client. TweetDeck is my choice presently, but the app is not the same as the iPhone or desktop app. Version 2 will give us similar options, but not much has been said on the timeline on the release. There are others, but what I like about TweetDeck for the Mac and even the iPhone is the feature rich options that allow the management of both Twitter accounts and Facebook. At this point, I suspect I will likely never need to bring my laptop to conferences again. Meetings are also a no-brainier. I feel the battery, and weight loss totally outweigh the small negatives that come up when the pad is your primary device. As apps improve and we get an update to the OS that will allow multitasking, it will be even more useful and further reduce the need to for a laptop. Feel free to add your thoughts in the comment section. Would love to hear how you use the iPad in similar situations, and if you have additional apps that might be better choices then what I suggested, please speak up. Still enjoying the device itself. Here are further thoughts as I use it more. Having the case really helps with typing. It allows for just enough angle sitting on your legs that improve typing ten fold. I might just be getting quicker with the keypad as well. Apps I'm using the most are Netflix, and GoodReader which is a PDF reader/manager. The PDF reader is by far the star for the week, and that says a great deal as there are a number of really good apps out this week. Things also seems to be very useful as an extension to my Things addiction on the iPhone and the Mac. I think a disappointing app this week is TweetDeck. I love this app on the iPhone and desktop but the iPad version is rather lacking on the features and I find that I don't even want to use it. A feature I use often on the desktop and phone versions is the Facebook feature that allows me to stay connected all in the same interface as the Twitter updates. To date, the iPad version is lacking this feature. The developers mentioned this feature is coming in version 2 so I hope this will be coming soon. Watching video is much more enjoyable on the iPad then the laptop. I found the heat of the laptop to be slightly distracting so having the ultra cool iPad and the super long battery life a welcome option. Not much of a fan of the iBook app as I work more with GoodReader. I believe books that you buy in the store will find a great home in iBooks but if you are converting other documents (like pdf's) then you might find that formatting might distract from the overall reading of documents. I need to use it more, but first impressions are so so. The last, and most critical reason in using the device is image viewing. I had the chance to use it with clients this afternoon and handing them the iPad with the images loaded and allowing THEM to navigate was very powerful. They went back and forth, zoomed, and commented without the need to instruct how to navigate. They just got it, and I think that speaks to the simple, yet amazing power this interface holds. Powerful stuff. Just a few quick thoughts on my first 12 hours with the iPad. Much faster then the iPod. Keyboard is good, just need to find the right angle which is tougher then you might think. Once you get it nailed, seems to type well for me. Key placement just different from iPhone keyboard to slow me down as well, expect for that to improve. Screen is amazing. Images really snap on this thing which is why I got it. Very excited to use it for Focal Flame. iBook is cool but needs more content. Much more content. I hope this goes the way of music and not movies in iTunes. I want to be in a world where I think or hear about a book and I can buy it on the spot. We are not there yet. Did I mention the screen is amazing? To say this is a large touch is like saying adults are large kids. Having the larger screen and apps that take advantage is an amazing experience. Weather-bug app is like having a weather man in your house. Finger prints are everywhere. Dust is everywhere. If that bugs you, be ready to be upset. More will come as I play with it today and tomorrow. For the last year you have been coming to this site for two possible reasons. Technology and photography. I'm proud to announce that for photography you can now start consuming www.focalflame.com. Robyn and I are both very excited and welcome you to check it out. That leaves technology, the primary focus for this site and blog starting today. Will focus on various projects I'm working on, as well as exciting news in areas of web development, apple technology, and other various topics. Feel free to leave a comment, or find me on the socal networks. A big thank you to all that attended the opening of "transform | sight" on November 6th. I really appreciate the support and being able to connect with everyone. It was a blast! The show is going very well as the month of November progresses and there are hints that the show my continue in December. Stay tuned! I also wanted to thank everyone that helped either directly, or indirectly make transform | sight happen. There are many of you, including Terese at the Froth House, Jo Ann Kraus, and of course Robyn. For the last month I've been consumed with transform | sight. I expanded my horizons on a number of levels and I now know that finding venues in which to show my creative side is very empowering and enriching, and focuses the creative effort. That said, I'm looking forward to getting the camera back in hand and shooting. I’ll be releasing some additional fine art images soon in the Gallery Store, so keep an eye on this blog, as well as on the Facebook Fan Page. From there I hope to be spending the rest of November and December working on a new fine art project that I've been kicking around. It's pretty hands-on....I think you will like it! Beyond fine art, I’ve been kicking around the idea of entering into the portrait and event area of photography. Not in the traditional sense of staged portraits, but rather “on location” photography for individuals and families wanting professional photos of things happening in real life. A personal photojournalist, if you will....capturing those important, candid moments of both everyday life and special events. I look forward to hearing your thoughts as I explore this more. 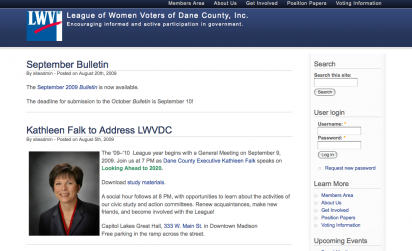 Proud to announce the launch of a new website for the League of Women Voters of Dane County. The local Dane County League of Women Voters organization provides non-partisan, community-based participation in reconnecting citizens with government, enhancing voter participation, including all voices in civic life, and strengthening the democratic process through reform. I gave a talk during the 2009 edition of the uber fun DrupalCamp WI event and I thought I would pass on the details of the talk here for participants could have a virtual location to rally around the discussion. An additional module that extends the Rules module (and many others) is the Token module (www.drupal.org/project/token). Once these are installed, administrators have a great deal of flexibility in configuring/creating content on a site, and then display that content in a number of ways that make sense for the specific use case. With the Rules module, administrators can configure a collection of actions based off a triggered event on the site. An example would be: send an email, and re-direct the user after they create new content. Very powerful stuff. Feel free to add a comment/question if you like. "We are teachers, business people, students, tradesmen, professionals, fathers, mothers, retirees – in other words, regular people - who share the bond of competitive cycling. Our members range in age from pre-teen to near 70. We rally around a philosophy that centers on getting fit, riding faster, participating in races, working together as a team, and HAVING FUN!" Good luck to all the club members this summer! I'm very excited to unleash the new Thayernet.com site today in part because of what you see now, as well as the possibility of what is to come. Thayernet.com has had many incarnations, variations, and purposes dating back to the mid 1990s. Its primary focus has been a means to publish and record personal events, interests, and passions of life. It was used to show achievements of bicycling, the discovery of parenting, and the joy of a child’s smile. Behind the vail, it was – as you would expect – a study of technology. In the spirit of Thomas Jefferson’s tweaking, and constant renewals of his home of Monticello in the pursuit to study architecture, form, and design; Thayernet.com has been a consistent means to explore web based communication. Today, visitors will be happy to know that the site will continue to document life as it passes. 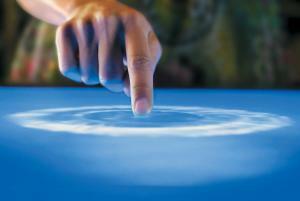 The site will also see an increased emphasis on a simple concept: helping bridge the technological knowledge gap. I have a deep passion for technology, and I've come to realize I have an equal, perhaps even stronger drive to help people with technology. This site will document the effort of combining those passions to enable people to achieve great things.